Milstar (Military Strategic & Tactical Relay) is the tactical and strategic multiservice satellite system designed to provide survivable communications for U.S. forces worldwide. The program is managed by the U.S. Air Force Space and Missile Center. The Milstar-1 satellites carry a secure, robust low-data-rate (LDR) communications payload, and a crosslink payload that allows the satellites to communicate globally without using a ground station. The Milstar-2 satellites extend the communications capabilities to higher data rates by adding a medium-data-rate (MDR) payload. The Milstar-1 and -2 satellites are fully interoperable for LDR communications and crosslinks. Boeing has the prime responsibility for supplying the MDR and crosslink payloads to prime contractor Lockheed Martin Missiles and Space Company. BSS subcontracts with TRW Space and Electronics Group for the MDR antennas and digital subsystem, and provides portions of the LDR payload under subcontract to TRW. Milstar satellites use a unique bus, consisting of three boxes, which are folded during launch and deploy in orbit. The MDR payload provides secure, jam-resistant communications services through unique onboard signal and data processing capabilities. It sends real-time voice, video and data to military personnel in the field at rates up to 1.5 Mbps. The payload uses a 32-channel EHF uplink and an SHF downlink. The MDR payload dynamically sorts incoming data and routes them to the proper downlinks to establish networks and provide bandwidth on demand. If necessary it passes the data on to another satellite via crosslink. Originally the full Milstar system was to contain ten satellites, which were cut to four. 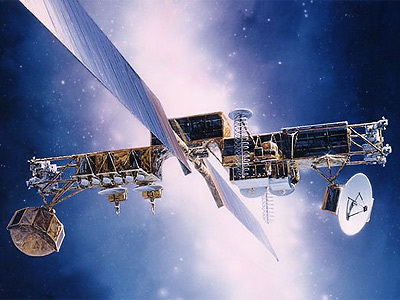 Milstar-2 1 was launched on 30 April 1999, but was stranded in a into a lower orbit than had been planned, and damaged by deployment at excessive rates due to a database error affecting the attitude control system of the Centaur upper stage. It could not be raised into its operational orbit due to fuel limitations. Its orbit was raised as much as possible to increase the expected lifetime and then it was permanently turned off after 10 days. Milstar was succeded by the AEHF (Advanced Extreme High Frequency Satellite) satellites.